How to Make Your ForeUI Plot Smaller? The design/development of ForeUI V3.0 is just started, and I have some time to write something. I plan to write a series of articles to introduce some advanced tricks of ForeUI usage, which will be very useful for all ForeUI users. Usually there will be some common parts between pages in your plot. 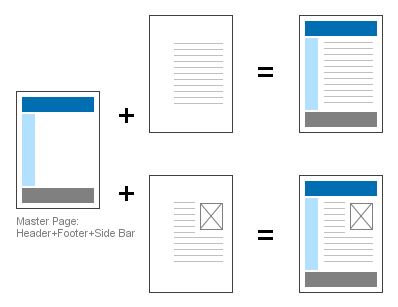 Although you could duplicate elements or even the entire page to make every page have the common parts, you are encouraged to move the common parts to a master page, which can be shared by other pages. This trick is frequently used for pages that have the same header, footer or side bar. 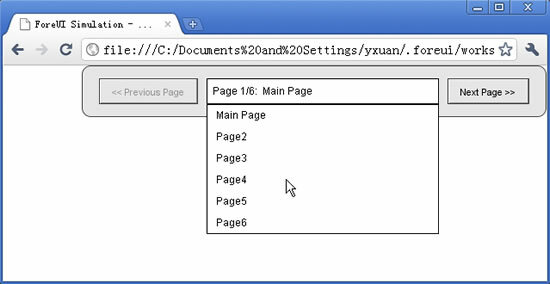 For example, all pages in your plot has the same header, footer and side bar. So you can place them in a page, and all other pages use this page as the master page. Thus you can just manage the center content on other pages, the figure below shows the details. There are 3 pages are used as master pages. 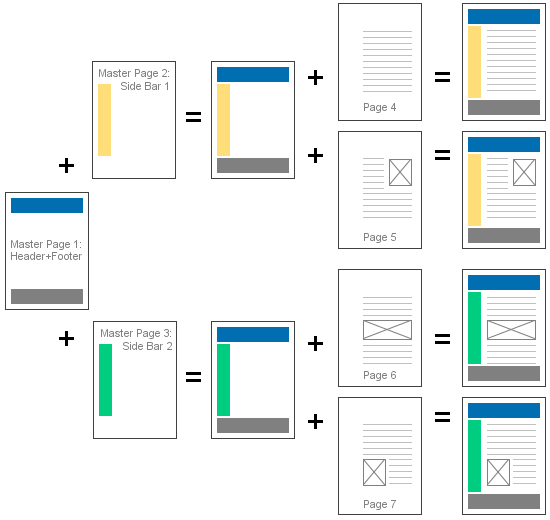 Master Page 1 is shared by Master Page 2 and 3, while Master Page 2 is shared by two pages (Page 4 and 5) and Master Page 3 is shared by another two pages (Page 6 and Page 7). This hierarchy should meet the requirements for most web site/app prototyping. By using master pages, you can avoid duplicating content in the plot, and significantly reduce your plot size. Experiments show that using images is the best way to enlarge your plot. So if you wish your plot become smaller, make sure your plot only includes the images that are necessary. It seems superfluous words, who would like to include unnecessary images in the plot? But sometimes you may do this unconsciously, consider this case: you add an Image Box element and specify an external image file for it, after a while you delete that Image Box and forget it. But the image is still stay in the Image Dock, and will be saved to plot file even it is not referenced anymore. If you did this a lot, your plot will be quite big, although most of the images in Image Dock are not used actually. You can see how many elements are referencing this image. If an image is not used by any element (used by 0 elements), you can just click the button to remove it safely. Remarks: you will need to update to V2.802+ to have the correct image reference number (fixed Bug_0309). Besides removing the unused images, you can also merge the duplicated images in Image Dock, which will also reduce your plot size. Again ForeUI V3 will provide this feature, but we need to do it manually for now. For example, say you have two images (img0 and img1) in Image Dock, they are duplicated and any of them are used by other elements, how could you merge them? 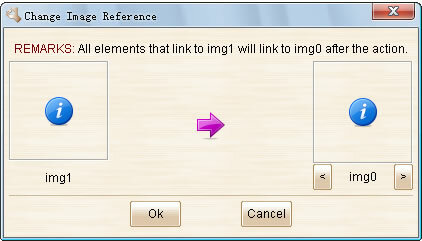 After you click the “Ok” button, all references to img1 will be changed to img0. So nobody is using img1 now, and you can safely remove img1. 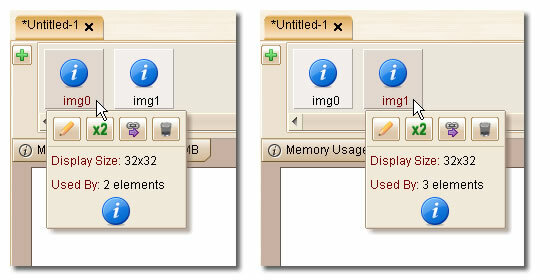 By removing unused images and merging duplicated images, your plot will become much smaller. You don’t have to do this kind of optimization all the time, but you’d better do it once before exporting the plot to DHTML. Rectangle is a very frequently used element in prototyping. However when you want to add a big Rectangle into your plot (e.g. make it as background), you can consider using a Text Box (with border shown, background filled) instead. Why? Because the Rectangle element will be converted to an image file when you export the plot to DHTML, bigger Rectangle will generate bigger image file. While the Text Box will be converted to just a snippet of HTML code, its size will not change when you enlarge the element. So if you need a big rectangle, consider using a Text Box with border and background first, as long as you don’t need the radius corner feature provided by Rectangle element. If your plot has many big rectangles and you replace them to Text Box elements, your exported DHTML files will become much smaller. In this article I introduced three approaches to reduce your plot’s size. It is not just about saving the space in your hard drive, it can also significantly reduce the DHTML files generated by ForeUI. If you upload the DHTML files to the Internet for people to review, smaller file size is bandwidth and time saver. I would suggest all ForeUI users to try using this approaches, and create small and powerful prototypes. Dear friends, it has been a while since last update, and this time it is a big one. This update includes a new language support and many new features and enhancements, with 5 bugs fixed. This version should be the last one that provides new features before version 3.0 is released (should be Q4 or year 2011). We may still release some minor updates before v3.0 for bug fixing purpose. Now you can choose “Brazilian Portuguese” from the languages list. Thank Francis Benito Odisi for the translation! Finally we created a very useful custom element: Page Navigator. We create the Page Navigator element with Rectangle, Button, Text Box and Table elements. 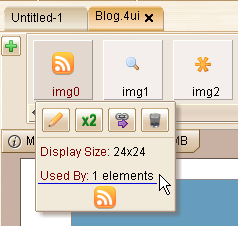 You can place it anywhere in your plot, and it will automatically dock itself to the edge of the page. 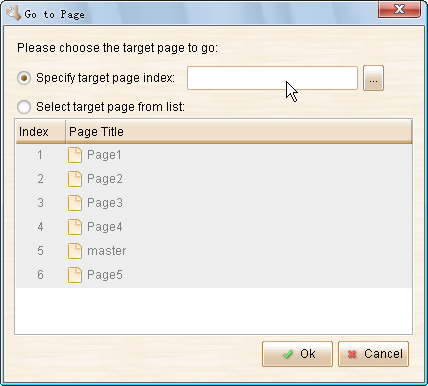 It provides the buttons for you to switch to previous/next page, and a pop-up list to choose the target page to go. You can place Page Navigator element on every page, but it is recommended to place it in a master page, thus other pages can share the same element. 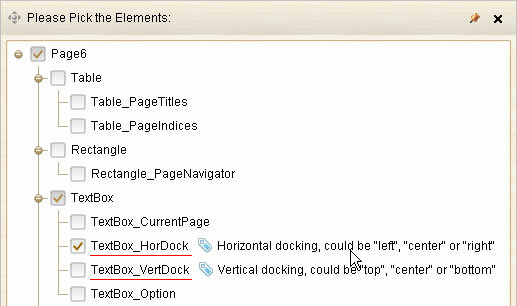 If you want to change the docking location of the Page Navigator, you can change the value of “TextBox_HorDock” or “TextBox_VertDock” element. We added the “Recent Expanded Section” and “Recent Collapsed Section” properties for Accordion element. It is suggested by pohldoug, thank pohldoug for the great idea! Also we implemented two new actions for Accordion: “Expand Section” and “Collapse Section”. Thus we can control the accordion with actions. 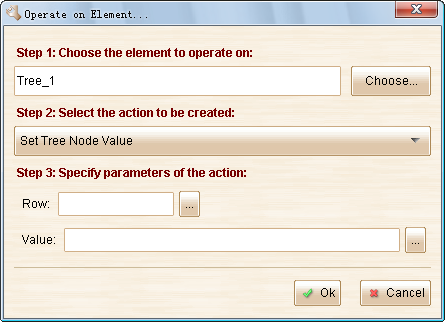 We enhanced the behavior of element creation (dragging from element category on left). Now you can directly drag element into container if you have right mouse button or the CTRL key pressed. Also the grid snap or object snap will take effect when you drag element into page (although those auxiliary lines are not painted, for performance consideration). 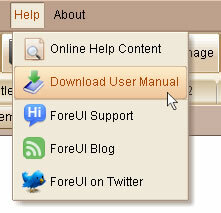 Now the paid user can download the printable PDF user manual from the “Help” menu. Moving/resizing elements in scrollable container become easier. Hold Shift key and start dragging, will force to enter the drag selecting mode. Avoid exporting CSS alpha filters in DHTML if element’s opacity is 100%. Bug_0302: Scrollable Container can not accept any element again if all embedded elements are removed or extracted. Bug_0303: Define “Set Global Property” action to set an in-existent property, then define that property in “Global Property” window. The action will not update when externally rename that property. Bug_0304: Could not embed element into container that overlaps on a bigger container. Bug_0305: The property in “row” or “column” field of “Set Table Cell Value” action is not updated when the property is renamed. Bug_0306: Can not drag custom element from category to working area in Mac OS (V2.70+).